Spanning a convenient 70-200mm equivalent focal length range, the Lumix G X Vario 35-100mm f/2.8 II POWER O.I.S. 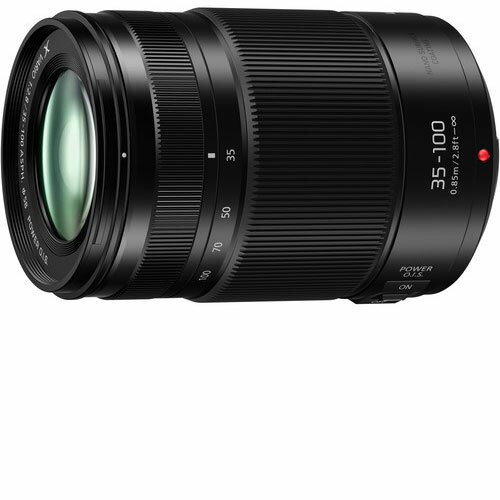 Lens from Panasonic is a telephoto zoom designed for Micro Four Thirds mirrorless cameras. Working in conjunction with the versatile portrait-length to telephoto focal length range is a constant f/2.8 maximum aperture that benefits working in a variety of lighting conditions as well as affords notable control over depth of field. A pair of extra-low dispersion elements and one Ultra extra-low dispersion element are featured within the optical design, to reduce fringing and chromatic aberrations, and a Nano Surface Coating has also been applied to suppress ghosting and flare for improved contrast and color fidelity. Panasonic Lumix G X Vario 35-100mm f/2.8 II POWER O.I.S. Lens – micro 4/3 is available for rent or hire from RENTaCAM Sydney.